Every online forum discussion about which is the right air compressor to buy leads inevitably to the conclusion that such and such a model is not big enough. Until you get into serious belt-drive models with enormous storage tanks you won't have enough air to run 500 air-tools simultaneously. The air gun will be used for cleaning saw dust off tools, and blasting crud out of the crevices in the back deck. Once in a while, a little bit of nailing and framing, perhaps the odd car tyre or lilo inflation. If these take a few seconds extra while it catches its breathe, its acceptable. At this price point, we can satisfy our urge to own an air compressor and have a tidy little unit that won't bleed oil everywhere if we store it upside down on the back seat of the Merc, or get bored one day and cut it open to see how it works. Extra points were awarded for investing in a half decent hose with well fitted connectors. Plumbers tape was used to ensure a leak free seal all round. So is this a serious upgrade to the kit, or just a toy? I think there's probably a decent compromise here for people who want to get some air power happening, especially for intermittent or very light hobby use, but who really can't justify the expense and space of a unit with both more capacity and power. I know that these things are supposed to be cooled by the freon coming back to the inlet, but if it runs hot, just get a cooling fan. Or you could use 2 in parallel for faster air charging. I've got a compressor out of a 1 ton AC I will save for this. I'll put it on my list of things to do. Freon?? They let you play with Freon where you live :-) ? 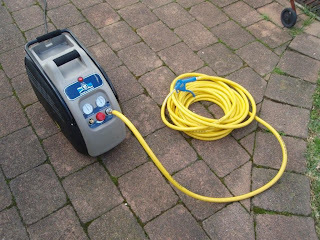 As far as I know the Spear and Jackson oil free compressor as pictured has no cooling system at all - saved only by the fact it runs intermittently. Perhaps it gets away with this for the same reason it doesn't require oil (nylon lined pistons ??) I've never really thought about cooling requirements for equipment like this but I guess you are right in that whatever is being compressed then expelled is going to carry out some of the heat, and the body should radiate some to the environment (which you could speed up with a fan). But hey, I can't be certain as I haven't yet been allowed to chop this compressor open yet to see everything inside. Sounds like you have some interesting little projects of your own - so please feel free to post us some links to them. there is a small fan on the rear of the motor section. One problem with this compressor is that the motor belt may break easily. Its a cheap enough for a new one at about $10 BUT, almost impossible for the average person to change it. Major dismantling and possibly special tools are required. One of the many claims made on the back of the ballistol can is its ability to dissolve rust. Here are before and after photos of a rusted spanner head sprayed with a generous coat of ballistol and left for about an hour. The ballistol was then dried off using a paper towel. This product continues to give pleasing results and I think warrants use on many rusted tools where it may be tempting to apply a wire wheel (potentially disfiguring engraving you didn't realise was there in the first place). This is an offcut of (I believe) Merbau decking, also known as Kwila. This is a species known for high tannin content which would explain the very strong reaction seen in the ebonized sample. This piece was soaked overnight in a jar of ebonizing solution.